Artlyst has travelled to Tate Liverpool which is currently presenting the first UK retrospective of late Austrian artist Maria Lassnig in an exhibition that runs in parallel with the gallery’s survey of Francis Bacon’s use of the space frame in ‘Invisible Rooms’. The show features 40 large scale paintings, the exhibition spans the Lassnig’s entire career; from the 1940s in Vienna right up to paintings made in the final years of the artist’s life. Self portraiture was a lifelong obsession for the artist, who described her work as ‘introspective experiences’. Lassnig even coined the term ‘body awareness’ – and with these two monumental exhibitions side by side, it’s not difficult to draw comparisons between Bacon and the artist. Lassnig’s work is certainly more than aware of the fragility of the flesh, but in this instance with the linear progression of an artist witnessing her own entropy. Lassnig created what could be seen as a singular lifelong oeuvre of work consisting of expressive, brightly coloured oil paintings with the human figure, using herself as subject matter: time literally passes the viewer as they wander this honest and slightly melancholic exhibition. This is art as an undeniable reminder of the mortality of existence, but there are no twisted sacks of meat, or screaming nurses trapped in the emptiness of a Baconian space frame. Instead this is the insipid decline of the artist, reflective, honest, and stark. Both Bacon and Lassnig also shared the process of painting figuratively during the heights of abstraction, both artists also placed the figure in an imagined and artificial space, but unlike Bacon’s twisted figuration, Lassnig’s painting was straight-up autobiography, and the artist represented herself with a boundary-breaking frankness. Image: Maria Lassnig, Self-portrait with Saucepan (1995). 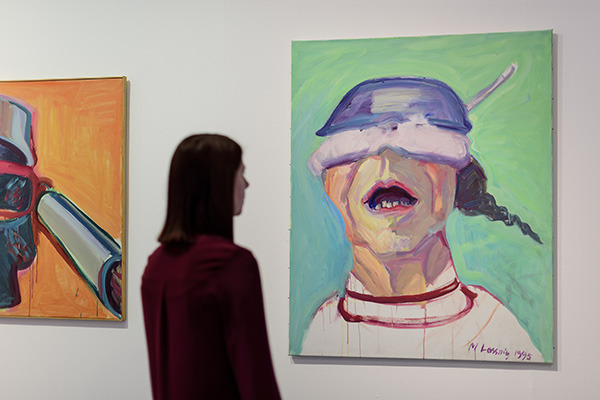 Courtesy ©Maria Lassnig Foundation. But how does this artist manage to successfully stand alongside the greatest post war figurative painter of all time? Bacon undertook the almighty task of expressing the futility of humanity – with a visceral immediacy – Bacon built his myth, as he tackled existential angst and horror with a keen eye on lovers, colleagues, fellow artists, even animals – and occasionally himself. Lassnig’s focus was entirely personal, internalised and subjective. The artist reflected on her own physicality with the narcissism of a sociopath – although I’m sure she was not – as the resulting work is too expressive of a concern with the pathos of humanity, a shared experience no matter how personal: we recognise her plight. The ‘fact’ that Lassnig manages to ‘trap’ is herself – the artist’s own existence – the paintings become mirrors of a temporal journey, and the conclusion is inevitable. The last unfinished paintings by Bacon, left sitting in his Reece Mews studio never to be completed may mark the end of a linear progression for Bacon in terms of work, but not in a narrative context, not in the same way as Lassnig, because the Bacon’s paintings do not form that direct ‘timeline’. Because of this there is an overall sense of unease to Lassnig’s work, even in its lighter moments, in this exhibition inevitability lingers. With Bacon the unease belongs to individual works, and ebbs and flows. With Lassnig it builds. With this temporal journey, the documentation of the artist’s physical passage through life seems all the more fleeting when viewed in this exhibition. The overall impact of Lassnig’s body of work is to finally reflect upon wasting limbs, infirmity, and the starkest self-portrait of her inevitable demise. This is a vivid oeuvre with a definitive ending that would even have had the master of existential horror himself rather impressed.